Coaching is holistic. It looks at all areas of one’s life (Relationships, career, business, finance, personal development, spiritual). In the coaching relationship the client is the expert. It is the client’s agenda that is paramount. As a client you have all the answers you need inside of you. Through coaching values, needs, desires, goals and visions are clarified. Everybody has a different dream – it could be writing a book, changing career or taking their company to the stock exchange. But for most people their dreams stay as dreams. Coaching is all about putting the client in the driving seat of their destiny as quickly and as elegantly as possible to achieve their dreams. Coaching is about achieving balance in one’s life. It facilitates change and progress in the client’s life enabling them to live a more fulfilling and purposeful life, congruent with their core values, priorities and sense of integrity. Coaching is action based and results focused. Action speaks louder than words! Tolerations are addressed, goals set and action plans created, all of which empower and motivate the client to move forward with a clear vision of the end in mind. Coaching is about Personal Responsibility. The client has more control over their life than they think they have. 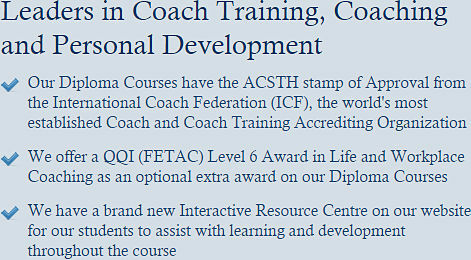 Coaching helps to create determination, dedication and commitment within the client to achieve their full potential. Self-belief, positive attitude and a willingness to engage fully with life to achieve one’s goals are emphasised and encouraged. The Coach will put a high value on honouring commitments. Coaches are allergic to excuses! Coaching is about Self-awareness. To know what you want, you must know who you are. A great philosopher once said that the unexamined life is not worth living. Coaching assists the client to identify their limiting beliefs, which may be holding them back and to replace those beliefs with ones that will help the client’s progress. Coaching is based upon the Applied Science of Success. Research from the business, scientific and sports arenas show that people are successful because of the way they engage with life and that anyone can draw from their experience and turn their life into something they may previously have only ever dreamed about. It is this body of wisdom and experience, ‘The Applied Science of Success’, that constitutes the staple diet of the professional coach. It all started in the ….. Coaching originated in the USA (of course!) in the eighties. It came about as a result of a number of synchronistic factors such as the success of sports coaching, the realisation by many therapists that a number of their “patients” actually had nothing wrong with them, and the need in business for optimising performance and achieving enhanced results. It was within this context that coaching as a separate profession was born. 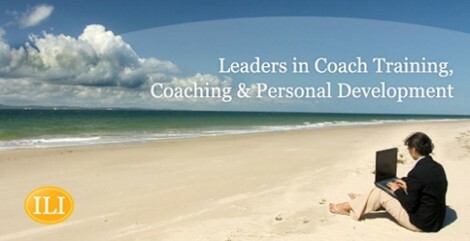 COACHING IS NOT COUNSELLING, THERAPY OR CONSULTANCY!